Found 4 file extension associations related to CloneDVD Mobile and 1 file format developed specifically for use with CloneDVD Mobile. 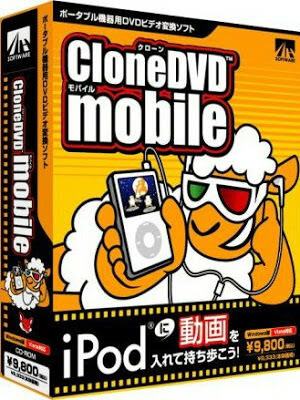 CloneDVD Mobile converts your DVD movies quickly and easily into a format that your portable device (Sony PSP, Apple iPod/iPhone/iPad Video, Android, iAudio X5, Creative Labs ZEN Vision, etc) can play. You can also convert your DVDs to other file formats, such as DivX, XviD, AVI, MP4, etc. If you need more information please contact the developers of CloneDVD Mobile (SlySoft), or check out their product website.